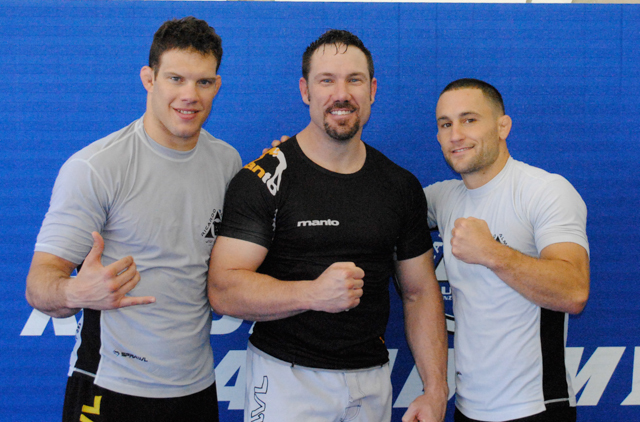 Ricardo Almeida, Rooney and Frankie Edgar. February 3rd was a very special day for me. Not only was I back at the UFC, but I was in the corner for one of my closest friends and training partners, Ricardo Almeida and alongside one of my greatest mentors, Renzo Gracie. For anyone that is a fight fan, I guess I was living a dream come true. From the weigh-ins to the locker rooms to the press conference, I had an all-access pass behind the scenes to look at all of the inner workings of the event. In addition to getting to be ringside at some of the fantastic fights that night, I also had the great pleasure of meeting and or getting to spend time with Minotauro, Kenny Florian, Gesias Cavalcante, Amaury Bitetti and got to watch a number of fighters in their different styles of warming up and preparing to fight like Gleison Tibau, Chris Lytle, and Marvin Eastman. Overall, this evening was a tremendous learning experience for me. When cornering a fighter for an event of this magnitude, it is easy to see that the days leading up to the fight can put an enormous amount of pressure on a fighter. Even though Ricardo had not fought in 4 years, he was amazingly relaxed during these few stressful days. As a result of this tranquility, I believe the fight itself went exactly as planned. The night before the fight, there was also an amazing forecast of the outcome of the fight: Ricardo stated that he would probably win by guillotine. After a four year “retirement” and only 1 minute and 8 seconds into his return to the UFC, Ricardo won by the predicted guillotine. Both his improved standup and superior Jiu-Jitsu allowed him to demonstrate this display of dominance. As we celebrated in the locker room afterward and watched the other fights that night, it was apparent that Jiu-Jitsu had come full circle in mixed martial arts and had made its return to the octagon. Not only did Frank Mir win via kneebar over the monstrous Brock Lesnar, but Nathan Marquart and Minotauro also won by guillotine that night as well. During the press conference that night hosted by Dana White, members of the press got to ask a number of questions of the fighters. Many of the questions regarded the usual, “What did you think of the fight”, but one Brazilian reporter asked Tim Sylvia what he thought of Jiu-Jitsu now. Tim humorously stated that he hated Jiu-Jitsu because this art was the reason for all of his defeats, and that he would continue to practice it more than any other discipline. That statement is what prompted me to write this month’s article. I believe that to practice a movement is important, but without the proper knowledge of both perfect technique and muscular requirements for this technique, successful execution is impossible. This article is designed to break down the muscular requirements of the guillotine so that an athlete can develop the proper strength and muscle patterns to go along with the necessary technique to execute the submission that devastated at UFC 81. There are a number of different ways that I have seen and been taught to apply a guillotine. Of the possible variations, two of the most commonly applied guillotines were demonstrated at UFC 81: the arm-in guillotine (Ricardo’s and Minotauro’s) and with both arms out (Marquardt’s). 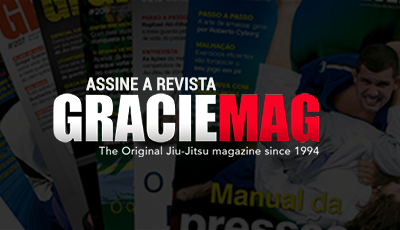 Having consulted over 10 black belts about this article (including Rolles Gracie, Roger Gracie, Ricardo Almeida, Igor Gracie, Gregor Gracie, Jamal Patterson, Alan Teo), each of them confirmed that a large portion of the guillotine’s success concerns pulling the opponent’s body in toward your own body. In addition to this, proper torque of the opponent’s neck is created not just with the arms, but also with the back and oblique muscles. The following six exercises are some of my favorites to develop both the strength and motor patterns for sinking a tight guillotine. Although these may be more advanced exercises for the beginner, any warrior can start to work these into their program. The grip is essential in maintaining the arms locked around the opponent’s neck. Without a strong grip, the opponent may break out of the hold. In this exercise, a thick bar is used with one hand to lift a heavy weight and hold for 20-30 seconds. Repeat for 5 sets each hand. The elbow flexors must be strong and have the endurance needed to keep both powerful and continued pressure on the choke until the opponent submits. Begin standing with the dumbbells at the sides. Curl the weight across the body toward the opposite shoulder with the little finger closest to the chest. While performing the curl, lean to the side of the working arm. Repeat for 4 sets of 8 on each arm. This area must be strong to retract the shoulders and scapula to help pull the arm and elbow backward to increase the pressure. If the arm can’t be kept back, the opponent’s head can escape. This should be performed with a narrow grip attachment. Begin with the arms completely extended and then when the weight is rowed, pull the shoulder blades together. Repeat for 4 sets of 8. This muscle works in unison with the obliques to side bend, extend the shoulder and arm back, and pull the head in to complete the choke. Without strong lats, you cannot close down the vice on your opponent’s neck. Begin standing next to the cable column with your arm hooked in a loop attachment. Then, as you pull the elbow tight to the ribcage, also side-bend the weight downward to engage the core. Repeat for 3 sets of 10 reps on each side. Many beginners don’t recognize that the guillotine requires side-bending, not just pulling upward on the neck. 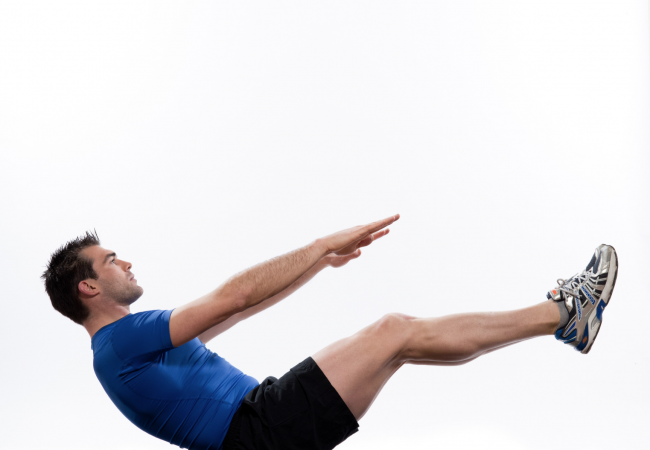 The obliques help create the pressure, so the athlete must be strong in this region. Begin side-lying on a bench with a partner holding down the legs. 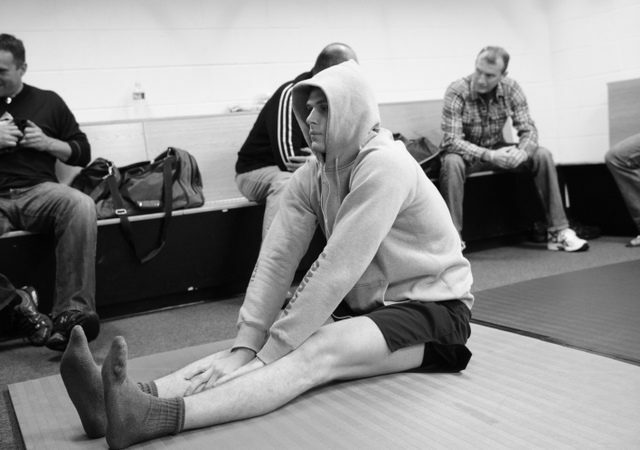 From here, side bend upward while completing the guillotine motion and hold for 5 seconds. Repeat for 5 sets on each side. The guillotine can be finished with the legs wrapped around either one leg (half guard), but is best completed from full guard. The hip flexors, abdominals and groin must be strong to wrap up the opponent and keep him trapped. Begin lying on your back with a band wrapped around both ankles as shown. As you perform the guillotine motion with a crunch, pull your knees toward your arms and hold position for 5 seconds. Repeat for 8 sets. * Martin Rooney is the founder of the Training for Warriors system and has trained champion fighters for the UFC, Pride, ADCC and Olympics. 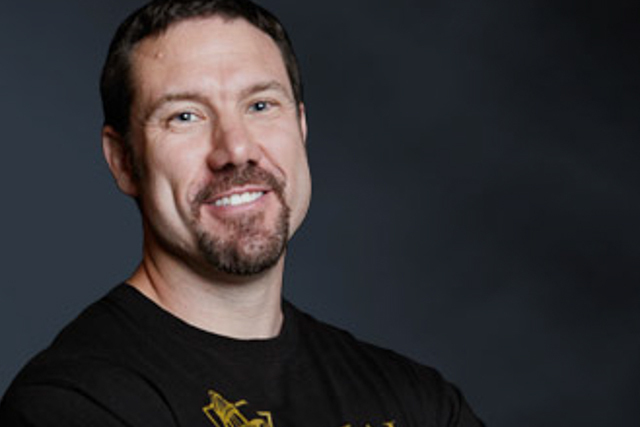 His TFW fitness program is used in over 175 facilities in 25 countries around the world. Information about TFW certifications at trainingforwarriors.com.